Julia Reed's love of adventure led her far from home -- and resulted in her wrongful conviction for treason against the British Crown. 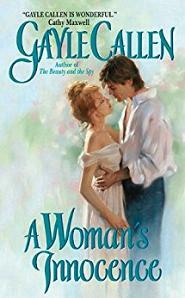 Now she faces a death sentence, thanks to the determined efforts of Sam Sherryngton, the dashing agent who arrested her, and a man whom Julia has adored in secret for years. that can no longer be hidden or denied. Each touchbrings them closer to sensuous surrender -- but will giving in to an irresistible temptation free their imprisoned hearts ... or cost two fugitive lovers their lives? Jail was a terrible place for a woman, even a guilty one. As Samuel Sherryngton stared at the dilapidated building in a rough-looking neighborhood in Leeds, he found himself hesitating, his jaw tight from spending so many hours grinding his teeth together in angry frustration. Julia Reed was in there, having spent ten days awaiting transport to trial in London, charged with treason. He hadn't seen her since she'd been led away, claiming her innocence with weary desperation. He still felt a pang of shock and disbelief, and a rage he sometimes wondered if he could continue to control. How had this happened to bright and sunny Julia, the little girl who followed him through gardens so many years ago? How could she have betrayed her country, her family--him? He knew he was taking this too personally, for they had not been close in many years. But thousands of people had died because of her. And he'd spent the previous month of August chasing her through England, ready to intercept her before she could kill the man who would testify against her. Taking a deep breath, he squared his shoulders and entered the jail. Even in the front office, the stench seeped out, full of hopelessness and fear. It was easy for him to obtain permission to see Julia. A few shiny coins were all that mattered to the jailer. After agreeing to their transaction, Sam set a basket on the desk. The man tilted back his chair and smiled wolfishly, his missing front teeth a black hole in his face. "Ye brought her food then, eh? The wench could use some. She eats like a horse." Sam leaned over the desk, directing some of his anger at the jailer. "You had better be taking good care of the prisoner. The charges against her have the attention of Queen Victoria." The jailer affably lifted his hands. "Ye need not complain about me, sir. She gets what everyone else does." Then he sorted through the basket, taking away the bottle of cider and several meat pies for himself. "No glass in the cell, gov'nor," he said with a smirk. Sam waited impatiently while the man unlocked the door, lifted an oil lamp, and led him down a dark passage. On either side were doors with bars as a viewing window. The air was hot, heavy, full of despondency. Someone coughed repeatedly, a deep emptying of the lungs. Another prisoner begged to ask a question, and the jailer ignored him. "You don't have a woman's area of cells?" Sam asked sharply. "How big a jail does this look like?" the man replied over his shoulder. "This ain't London. And the lady got a window, somethin' rare." At the last door, there was a feeble light from within the room, the promised window. The jailer unlocked the door. "Ye want me to come in with ye?" "That won't be necessary," Sam said. He stepped through the doorway and straw crunched under his feet. "Julia?" His voice sounded harsh even to himself. He'd get nowhere with her if he couldn't control himself. She made not a sound. The door clanged shut behind him. There was a mound of blankets on the cot and a bucket in one corner. "Call when ye need me," the jailer said. His uneven footsteps faded away. "Julia?" Sam said again, louder, with an edge of worry he thought he'd never feel for her again. The blankets suddenly moved, and in the dim light, he watched the woman push herself slowly to sit against the wall. The white-blond hair that so distinguished her hung disheveled and dull. She wore a thin, shapeless dress, more a smock, that sagged off one white shoulder. He should despise her for what she'd done--but something nagged at him each night as he lay sleepless in a nearby hotel. "Sam?" Her usually expressive voice was cold. He nodded and took a step towards her, watching as she sat up straighter. "How are you, Julia?" She cocked her head. "Well that's a ridiculous question," she said sarcastically. He sat down on the edge of the cot, testing it first with his weight, to make sure it didn't collapse beneath them both. He set the basket between them. They stared at each other in the gloom, and he saw the dirt that smudged her face, the dark shadows beneath eyes that glistened. But she didn't cry. He almost wished she would. "So you brought me food, Sam. Am I supposed to thank you? What more could you want from me?" She drew her knees up against her chest and hugged them to her, though it was hardly cold in this oven of a jail. It was just another barrier between them. "I don't know," he said, giving in to the bewildering thoughts that chased around inside his head. "This is one of the hardest things I've ever had to do." "If you're looking for redemption, then you might as well leave." "Then just go. Surely you'll see me at the trial in London, you and your fellow soldiers, full of enthusiasm, ready to gloat." Sam closed his eyes and rubbed a hand over his face. "You think I'm enthused about any of this? This type of crime…I still can't grasp that you were a part of it." She sighed again and spoke in a dull, flat voice. "Don't bother hoping that I might incriminate myself. I didn't do anything. I've already told you that. But no one will believe me." "There's too much proof," he said forcefully. "Sam, who could possibly hate me enough to want me dead?" she continued. "You know that's the punishment for treason. Death by beheading." He said nothing, sickened by the thought of her baring her long white neck to a blade. She sounded so convincing, so desperate. She had always been able to appeal to his protective instincts. What if she was telling the truth? That was why he was really here, wasn't it? Some part of him still thought there had to be a mistake somewhere. Was he just a fool? "I just saw Edwin Hume," Sam found himself saying against his better judgment. Hume was to testify that he'd worked for Julia, passing along information about British troops to the Russians--information which had helped ensure the deaths of sixteen thousand soldiers and their families in Afghanistan. For a man trying to save his own neck, Edwin hadn't even been able to look Sam in the eyes. He'd taken to drinking, and would now have to be guarded to make sure he would remain a credible witness at the trial. "He's lying," Julia whispered angrily, "but I can think of no reason why. He was part of my household, my governess's shy son. When I was young, you always encouraged me to befriend him." "He was more of your age," Sam said briskly. "I was so much older than you. It was inappropriate for me to be your constant companion, even if it was in simple friendship." "There were only six years between us. Not so much." "Maybe not now, but back then--" He broke off. She'd been the master's daughter, he the gardener's son, and at the end a grown man to her fourteen years. He had realized they couldn't be friends anymore. Julia sighed. "Edwin and I shared our first kiss." He said nothing, though he remembered well his feelings of jealousy. That sweet kiss, not meant for him, had been the final catalyst for Sam's entry into the army of the East India Company. He knew even then that he could not stay in England and watch her grow up and away from him. Had she felt deserted? Was it his fault that she'd turned to other men? "And now Edwin has betrayed me," Julia continued harshly, but with bewilderment. "I haven't seen him in ten years, since I joined my brother in India. I had no idea Edwin had even left England, and I certainly never saw him in Afghanistan. I can't believe that he conceived this plot against me. The man I knew would have been incapable of such a crime." Sam thought of Edwin, a drunkard now, a man beaten by life. Was there a chance that Edwin was lying, that someone else was involved in a deliberate attempt to destroy Julia? "Tell me this proof," she said fiercely, her fists clenched on her knees. "Explain it all to me. I was in shock when you arrested me, and I remember little of it. And the jailer just shrugs at my questions." He didn't want to go through it all again but…something didn't add up, and he had long ago learned not to ignore his instincts. Maybe if he said it out loud, it would come to him. "The first thing that alerted us were the whispers of treason we began to hear in Kabul, months before the massacre. Then one of our informants saw a British woman with pale blond hair deliver a letter to the hide-out of a Russian officer." He saw her stiffen, but her voice was brisk and impassive. "There are no other blond Englishwomen?" He shrugged. "He said the woman's hair was so blond as to be white. And we already knew you'd been in Kabul unescorted, because I had discovered you. Your brother is a British general--surely you can understand why you were one of the few people with access to military information." He raised a hand before she could protest. "In no way did we believe it was you just from this meager evidence alone. But then Nick Wright was visiting the Russian officer in an unofficial capacity, and he saw a necklace casually left on a table. He knew he had given it to you." Would she deny her affair with Nick--or with the Russian? Her eyes grew as frosty as ice. "As I told you when you arrested me, it had disappeared from my jewelry box." "You're trying to say that somebody took it to frame you. You were living with your brother, so he had access. Who else did?" "Our servants. We'd brought a cook and maid from India with us. We had officers for dinner several times a week. I couldn't even begin to name them all." She lifted her chin as if to say she'd proved her point. "As you've already seen, we have two of the letters written in your own hand, with a code added that betrays British military troop strength." "Anybody could have intercepted those letters and added their own code." "We have documented testimony you were seen delivering them!" She flung her hands up. "Your witness could have been paid to say whatever the real traitor wanted him to say!" His anger faded, replaced by tired bewilderment. "Altogether this evidence is damning, and you can't refute any of it." "The real traitor is out there, Sam," she said passionately. "The evidence was all set up for you too perfectly." He was being a fool, letting her sway him. But what if she was right? Could he watch her go to her grave, without being absolutely sure? He frowned. "Tell me again why you traveled north to Leeds to meet with Edwin Hume." She twisted to face him, her knees now on the cot, and leaned toward him. "My old governess died in her sleep, and she left possessions my brother thought Edwin would want." He well remembered Lewis Reed, now a general in the queen's army. As young boys they'd played together, but Lewis had soon realized the differences in their stations. There had been animosity between them from then on, and Sam had been stunned by Lewis's indifference to his sister. Yet Julia claimed that the governess's death was the catalyst for her journey. Edwin had said this story was agreed on before hand, should their meeting be discovered. But the old woman had died only a few weeks ago. Had the story been concocted before she died? And did that mean someone had deliberately killed the governess, just to fashion an alibi? Sam needed to question Edwin further. And if Julia had betrayed her country for money, where had the money gone? None had been found. He stared into her face, not allowing himself to believe that there was a chance she could be innocent. For a moment, her eyes caught the scant light from the window, and seemed to shine with that odd, blue color of stained glass windows that had always fascinated him. "No more questions, Sam?" She tilted her head mockingly. "Nothing else to go over?" He got to his feet. He was on his own trying to look deeper into her case. Everyone else believed a swift trial and execution were all that was left. He couldn't go to his compatriots, Will Chadwick or Nick Wright. Not only did they believe her guilty, but Will was off on his honeymoon and Nick had gone to offer his own marriage proposal. They'd been three spies ordered to uncover a plot against England--maybe only a spy could discover the real truth. And Sam was a damn good spy. "I have to go," he said, turning to rap on the door. She scrambled to her feet, tall in the meager cell. To his surprise, she asked, "Will you come back?" Just an hour ago he would have refused. "I promise I will," he said, then turned away as the jailer arrived. Julia watched the door close behind Sam, and though she hadn't thought it possible, felt even more alone than before. The jailer leered at her between the bars before he followed Sam down the hall, but she only turned her back, having learned that he was too much a coward to attempt her harm. She went to the window and pressed her face to the bars, her only view the polluted shores of the Aire River, crowded with mills and slaughter houses. The smell was little better out there, but she closed her eyes and inhaled deeply of freedom. It had been ten days since she'd been cut off from the world, ten days of listening to the hopelessness of other prisoners, the occasional shouts or the quiet sobs late in the night. The despair of this place weighed on her, threatening to close her throat with the hoarse sobs she yet held back. She'd cried when Sam and Nick had first captured her, but not since. She was too numbed by all that had happened, all they'd accused her of. She had her sins, some of which she didn't want revealed--but treason and murder weren't among them. So many people she'd known had been among the dead, their friendships lost to her forever. Her brother had been transferred from Afghanistan back to India six months earlier, and she'd gone with him, realizing only later how fortunate they'd been. Thousands and thousands of men, women and children were killed by the Afghanis, who'd wanted the British invaders gone. Even now, the images of their faces still haunted her--the officers' wives who'd insisted on inviting her to dinner whenever the soldiers were away, the children who gathered in awe around her horse, which had been bred to be the fastest. They were all dead, slaughtered as they tried to leave the country under a peace treaty in the dead of winter. And her own government was accusing her of causing it. Grief and despair welled up inside her again, and she fought it back, knowing she needed a clear mind. These accusations had even cost her her brother. They'd never been close, but she'd been certain he would answer her letter, do all within his power as a general in the queen's army to discover the true criminal. Instead, he must have believed the lies, because he'd never responded. Her only visitor was the man who'd put her in jail. Julia looked at the incongruous basket that perched on the cot. She shouldn't eat anything Sam had brought. He was only appeasing his guilt. But surely good food shouldn't go to waste. She removed the cloth spread on top, surveyed the contents appreciatively, and bit into a cake dripping with a sweet glaze. She even licked her dirty fingers when she was done. There was more to eat, but her belly was already growling a warning, so she'd better take her time. Her mind went immediately back to the things that haunted her. She'd spent her hours in jail fighting the encroaching sense of defeat by trying to figure out who had framed her for such a terrible crime. Who could hate her enough to want to see her executed? But her thoughts had gone round and round, disjointed and confused. Had her behavior in Afghanistan made her an enemy she didn't even know about? She had lost more than her inhibitions in that foreign country. She'd forever lost Sam. In a childhood filled with duty and distance and indifference, her only true friend had been Sam, the gardener's son, and her escape had been the gardens. He came from a large, loving family she'd envied, had sisters she enjoyed playing with. But it was Sam himself she'd always been drawn to. Though he was six years older, he'd always treated her with respect and friendship. But then he'd joined the army, followed soon by her brother. Her parents had died of the fever, and she was alone at fourteen years of age with only the servants, soon forgotten by even the villagers. She had always known she wasn't like other women. Though she'd lived on a large estate, it had always felt like a prison to her. There had been no one but the servants who pitied her, yet they could not cross the boundary that divided their classes. She grew used to being alone, but gradually the restrictions chafed at her. She'd ridden her horse across streams, through forests that she pretended went on forever. But the end of her family property was as solid as an invisible boundary. She could never go farther, restricted by her age-but mostly because of her gender. Freedom had always called to her, had beckoned to her from across oceans. The globe in their family library had constantly twirled under her hands as she saw the continent her brother traveled, traced with her finger the paths he wandered. Not that he ever sent letters himself, even then. She was just his sister, a nuisance--a dependent. But he was the key to her freedom, and she focused on him with single-minded determination, hoarding every shilling in pin money and in unused household budget which the sympathetic housekeeper passed on to her. When she turned eighteen, nothing could stop her. She bought a ticket to the East, and even through a miserably long voyage, her excitement could barely be contained. When she'd arrived in India, her brother had disapproved, but he hadn't sent her home. That would have meant sparing time and thought--and money--on her. Instead he made sure she knew she was always a guest, never a part of his household. She'd finally realized that her last hope of belonging to her own family--a real family--would never happen. She gave up that dream, determined to exchange it for the freedom a woman in England never had. And it had seemed to work for many years, years of travel and adventure and new cultures to explore. But even the ability to do as she pleased paled after awhile when she had no one to share it with. The price for freedom--loneliness--sometimes grew too much to bear. Her disappointment occasionally made her cross the line of propriety into places she wasn't proud of. When Lewis had been recalled to England, she'd tried to look at it as another adventure, the chance to find the companionship that had always eluded her. With a heavy sigh, she dug into the basket and bit into a flaky meat pie. No one but Sam Sherryngton, who'd disapproved of her in Afghanistan, who'd helped to arrest and imprison her. He might as well be a stranger now. His brown hair had just a touch of red, and she used to imagine he hid a fiery personality. But he'd always been calm and deliberate with her, even when confronted by her misdeeds. His golden brown eyes, which she'd once thought held the secrets of the earth, now betrayed only icy indifference. When he and his fellow spies had captured her, he'd remained in the background, letting Nick Wright lead in her questioning. The shock of the arrest still hit her like a blow, and knowing Sam believed it all made nausea roil inside her. He'd believed the lies someone had woven about her. He'd helped track her down across England, instead of helping her. She'd spent the past ten days with his face emblazoned in her mind, full of bitterness that he'd rather see her dead than listen to the truth. She'd been unprepared for the sight of him here in her cell, bearing food, full of questions. There'd been doubt in his eyes. Dare she hope that he would help her? Or did he want her to take him into her confidence so he could betray her? Sam took out his frustration on Edwin Hume's door as he knocked for a second time. Nothing. Edwin's horse was in the stable behind the house, and he wasn't at his favorite tavern across the street. Urgency overtook Sam, making his stomach tighten, making the world around him suddenly sharp and clear. And as usual, he felt the thrill of the hunt. He stepped behind the shrubbery and peered in the front window, shielding his eyes with his hand. He could see the deserted parlor and a corner of the dining room, and spotted the one inconsistency: a boot on its side, just in the line of his vision in the dining room. Was there a leg attached? He walked around the house at a quick pace until he reached the back, facing an alley. The door was ajar and so he slid his pistol from his pocket, cocked the hammer, and slowly stepped inside. The kitchen was a cluttered mess, more with empty liquor bottles than food. And then through the kitchen door he saw Edwin Hume lying on the dining room floor, unmoving, a wide swath of blood across his chest. Sam gritted his teeth, holding back his curse. Though he assumed Hume's assailant was gone, he went through the house quickly, methodically, until he knew he was alone. Then he stood over the body, his mind already sifting through motives and meanings. Hume gave a soft cough, and Sam dropped to his knees in astonishment. He shook the man's shoulder, then ripped open his shirt. Just beneath his heart, a hole in his chest oozed blood with every beat of his pulse. Sam pulled a handkerchief from his pocket and pressed it over the wound. "Edwin!" he said with more urgency. "It's Sam Sherryngton. Open your eyes!" The man's eyelids fluttered, but never fully opened. Hume coughed again, weaker this time. His lips parted, and Sam leaned over him to catch his words. Sam stared at the dying man. "Julia's brother was here? He did this to you?" With only the barest shake of his head, Hume whispered, "Paid…someone. Just like he…paid me. He's--" A coughing fit made blood trickle from his mouth. Arching his back with a gasp, he finished with, "--the real traitor. Tell Julia that--tell Julia--"
His body slackened as he died. Swearing, Sam sank back on his heels. General Lewis Reed? The man had betrayed and framed his own sister?